Very slender book, drawn from a newspaper column and intended for readers who know nothing about science. 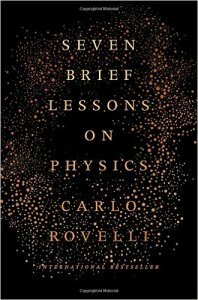 I read it because it’s short and because a NYT review of the book, pointed out that its final chapter is about human meaning in the universe as discovered and described by physics—with a sobering conclusion. What role do we have as human beings who perceive, make decisions, laugh, and cry, in this great fresco of the world as depicted by contemporary physics? If the world is a swarm of ephemeral quanta of space and matter, a great jigsaw puzzle of space and elementary particles, then what are we? We are also an integral part of the world that we perceive; we are not external observers. We are situated within it. Our view of it is from within its midst. We are made up of the same atoms and the same light signals as are exchanged between pine trees in the mountains and stars in the galaxies. We have learned that our being is only a part of the universe, and a small part at that. This has been increasingly apparent for centuries, but especially so during the last century. We believed that we were on a planet at the center of the universe, and we are not. We thought that we existed as unique beings, a race apart from the family of animals and plants, and discovered that we are descendants of the same parents as every living thing around us. We have great-grandparents in common with butterflies and larches. We are like an only child who in growing up realizes that the world does not revolve only around himself, as he thought when little. He must learn to be one among others. Mirrored by others, and by other things, we learn who we are. If we are special, we are only special in the way that everyone feels themselves to be, like every mother is for her child. Certainly not for the rest of nature. We gradually learn the nature of the real world, in ways that are different from the mythmaking of human history. “The confusion between these two diverse human activities—inventing stories and following traces in order to find something—is the origin of the incomprehension and distrust of science shown by a significant part of our contemporary culture.” P69. We are a species that is naturally moved by curiosity, the only one left of a group of species (the genus Homo) made up of a dozen equally curious species. The other species in the group have already become extinct—some, like the Neanderthals, quite recently, roughly thirty thousand years ago. I believe that our species will not last long. It does not seem to be made of the stuff that has allowed the turtle, for example, to continue to exist more or less unchanged for hundreds of millions of years, for hundreds of times longer, that is, than we have even been in existence. We belong to a short-lived genus of species. All of our cousins are already extinct. What’s more, we do damage. The brutal climate and environmental changes that we have triggered are unlikely to spare us. As we know more or less well how to deal with our individual mortality, so we will deal with the collapse of our civilization. It is not so different. And it’s certainly not the first time that this will have happened. The Maya and Cretans, among many others, already experienced this. We are born and die as the stars are born and die, both individually and collectively. This is our reality. Life is precious to us because it is ephemeral. Yet he ends on an upbeat note. It is part of our nature to love and to be honest. It is part of our nature to long to know more and to continue to learn. Our knowledge of the world continues to grow. … Here, on the edge of what we know, in contact with the ocean of the unknown, shines the mystery and the beauty of the world. And it’s breathtaking. This entry was posted in Book Notes, Science, Species Reset. Bookmark the permalink.